We’ve been hearing a few reports that my newest Lisette fabric collection has finally arrived in Spotlight stores, so it’s finally time to tell you all about it! I’ve been having so much fun with watercolor and layers of soft color for these designs. The prints are loose and relaxed in feel, and the watercolor gives them lots of lovely texture. We’re using a new (to us) mill in India for these fabrics, and they really did a great job. The entire collection is printed on a really beautiful jersey. It has a wonderful hand, and the printing is just as I hoped it would be. Jersey is such a fun fabric to sew. It has plenty of stretch and good recovery, and it’s suitable for a wide variety of garment types. As you probably know by now, knits are really fast and satisfying to sew. This particular quality is substantial enough for leggings but also drapey enough for dresses and T-shirts. I really couldn’t have asked for better. I think you’re going to enjoy working with the fabrics themselves. I’ve been playing with them for a few months now and am so happy with them. To help introduce the line, we made up a few examples to show what you might want to do with the fabrics. Of course you can make T-shirts with the jersey. 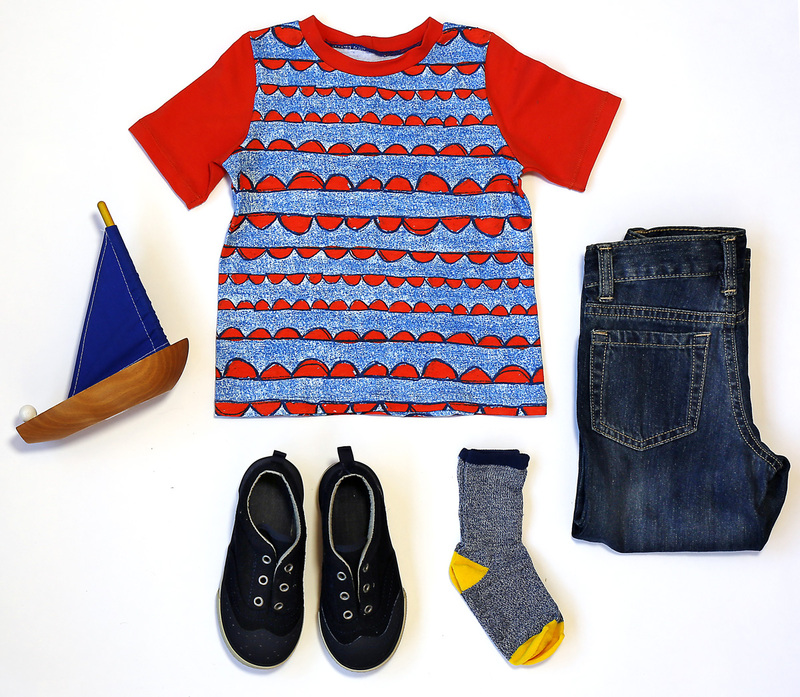 For kids, the School Bus T-shirt, Field Trip Raglan T-shirt, and Lunch Box Tee are all designed for knits, so they’re an obvious choice. For this Lunch Box Tee I paired the orange and blue scallop print with a solid from Robert Kaufman’s Laguna jersey collection. The colors are a perfect match! You might remember that I recently sewed new pajamas for S using the Playtime Tunic and Leggings. These are getting a lot of wear, and not just to bed. They’ve become sort of a lounge outfit for those occasional Saturdays when we just don’t quite manage to get out of our PJs until the afternoon. (I think the leggings have also gone to school a few times, which I suppose is testament to their comfort and softness. She just doesn’t want to take them off, and they make a great cold-weather layer under jeans and long pants.) You could also sew the Hopscotch Top or Dress, which is designed for jersey as well. 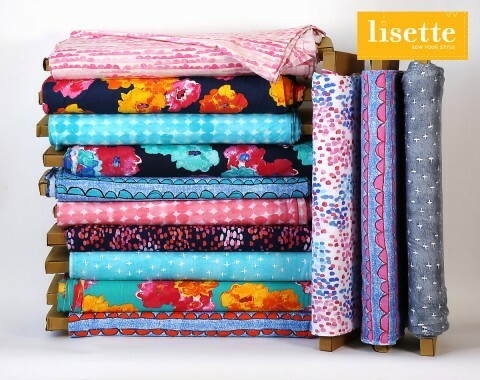 I want to wear a lot of these prints, too, and it turns out that the Liesl and Co. Everyday Skirt works beautifully with jersey! Just be sure to use a woven fusible interfacing for the front waistband so it doesn’t stretch when it’s worn. Of course, the Metro Tee and Bento Tee patterns would also be perfect to use with these knits. I’ve been thinking that the Lisette Attache peplum or dress would also be really cute in jersey, as would the Lisette Diplomat dress, especially the shorter version. These fabrics are available exclusively in Spotlight stores now, so if you’re in New Zealand, Australia, or Singapore I can’t wait to see what you make! They are lovely, the grey is my favourite. Oh how exciting! The range of knits at Spotlight is sorely lacking so far so this makes me very happy. These are really beautiful prints. Can’t wait – world wide? Spotlight Australia as well? Kylie, yes, Spotlight Australia. In stores now! OMG, I’m dying over these knits! But will they not be available in the U.S.? I’d be so sad. Jen, sadly they won’t be available in the US. I purchased some of these last week at Melville and Cockburn WA and went back for more and can’t find them. Have they sold out already? It would be best to check with your local store. Typically, once a line is gone, it’s not restocked. But they may be able to get some from another location from you on request.